I have been obsessed with pomegranates this season (remember my recent recipe for Banana Oat Bread with Pomegranate?) Those little jewels of pure goodness are just so delightful. So I was pretty disappointed when all the grocery stores stopped carrying them after Christmas. I managed to find a couple just a few days after New Years, but now I can't find them anywhere. It's depressing. Thankfully, however, I have been able to find pomegranate juice. This stuff may get me through this bleak pomegranate-less season. This juice was the inspiration for this cheesecake. To make this cheesecake you will need a springform pan. They're really not expensive, and are a good investment if you want to make cheesecakes, because no other pan quite does the job. Note: If fresh pomegranates are in season, some pomegranate arils mixed in the cheesecake or scattered on top would be amazing! Preheat the oven to 350 if using a silver springform pan, or to 325 if using a nonstick springform pan. 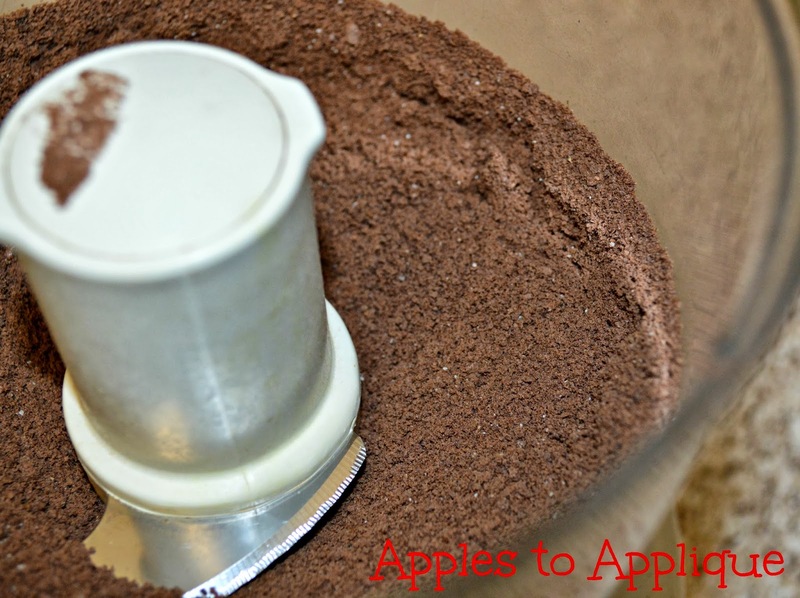 Break the graham crackers into large pieces and place in a food processor. Process until crackers are reduced to fine crumbs. Add the butter and brown sugar, mix until smooth. 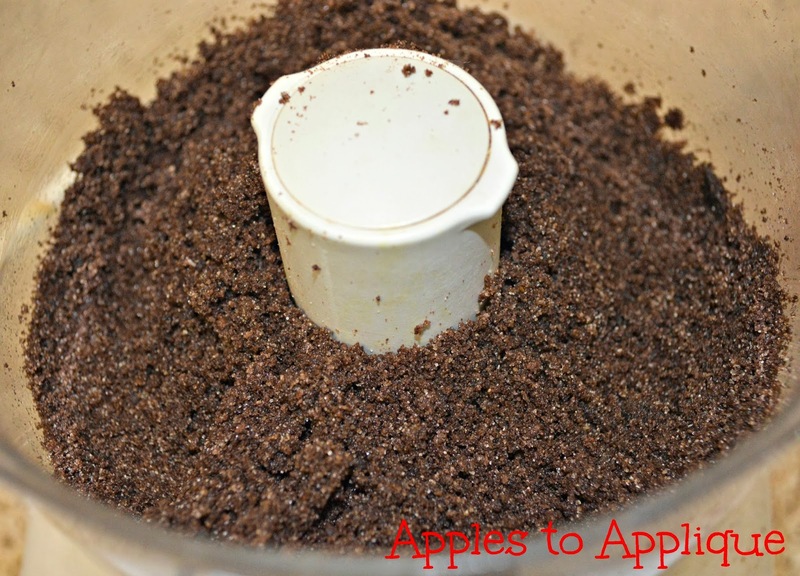 I usually just do this with the food processor, but you can mix it in a bowl. 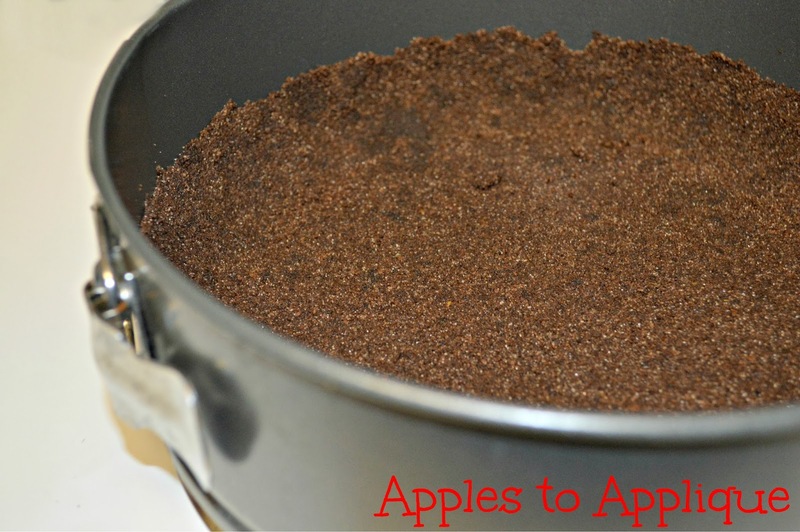 Press the crumb mixture onto the bottom of the springform pan and about halfway up the sides. In a mixing bowl, combine cream cheese and sugar. Beat until smooth. Add pomegranate juice and vanilla; mix well. Add eggs, one at a time, beating after each addition just until blended. Don't over beat, or too much air will get into the batter, and your cheesecake will have a better chance of cracking. I was much happier with the color after the addition of food coloring! So pretty! Even before it's baked! Bake for an hour to an hour and ten minutes, or until the center is almost set. You can see in the picture below how the center still looks a little wet. Turn the oven off and open the oven door slightly; let the cheesecake set in the oven for an hour. Remove the cheesecake from the oven and cool completely. In case you're wondering, this helps the cheesecake to change temperatures gradually, which also lessens the chances of it cracking (aka the biggest frustration ever with making cheesecakes!) I've never had one crack using this method (knock on wood)! Refrigerate for 4 hours or overnight. Before serving, loosen the cheesecake from the sides of the pan by running a knife along the edge. Remove the rim. 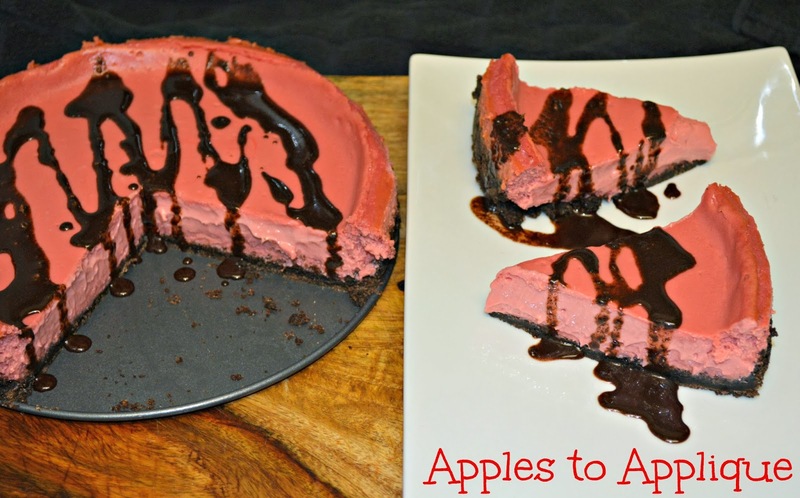 Serve with Dark Chocolate Pomegranate Glaze (recipe below). 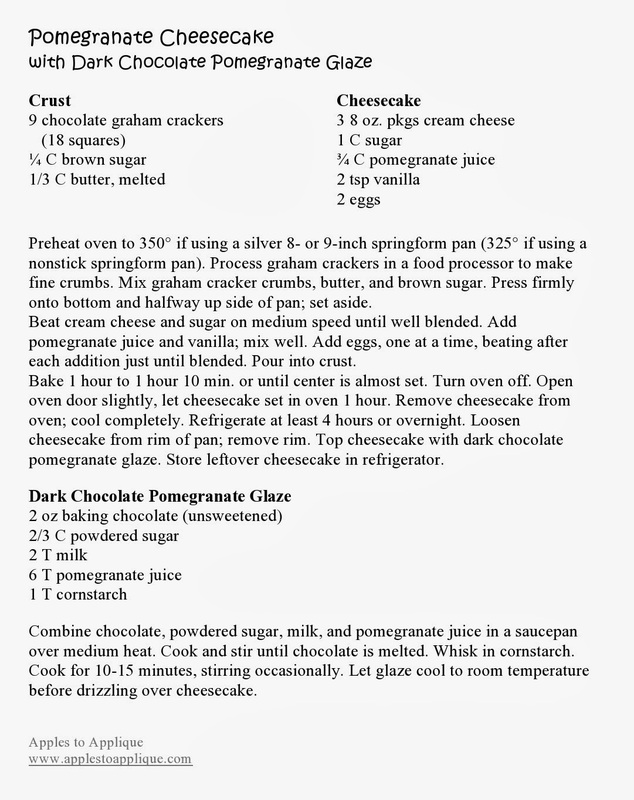 To make the glaze, combine chocolate, powdered sugar, milk, and pomegranate juice in a saucepan over medium heat. Cook and stir until chocolate is melted. Whisk in cornstarch. Cook for 10-15 minutes, stirring occasionally. Cool to room temperature, and try to not eat it all with a spoon before drizzling it over your cheesecake. It tastes so good; it reminds me of those chocolate oranges, only with pomegranate flavor. Yum! I hope you enjoy serving up this festive cheesecake to the special people in your life! Linking up with Full Plate Thursday, Foodie Friday, and the Wednesday Roundup. This looks great. I really like your step by step instructions and the comments. Thank you! I have worried about being too detailed, but have had people tell me they appreciate it. I like to break things down into simple steps so people aren't intimidated to try new things! Thanks Ambreen! 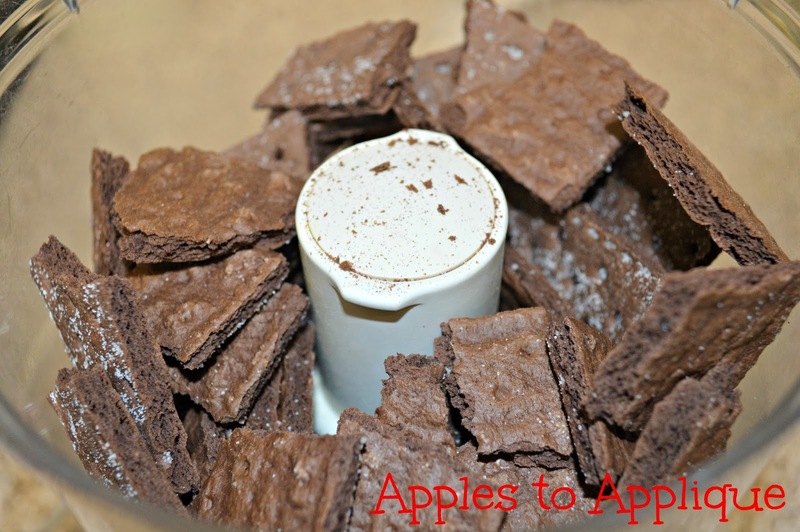 I hope you enjoy the recipe; thanks for stopping by! 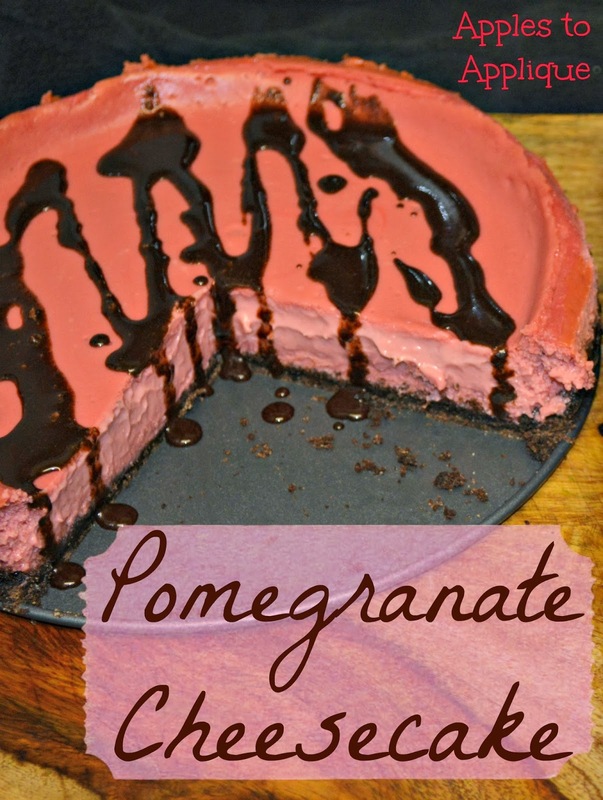 I love your Pomergranate Cheesecake it looks awesome! Hope you are having a great week and thanks so much for sharing with Full Plate Thursday!